PayPal is the easiest and fastest way to start accepting credit cards online. All you need is your own PayPal account. The simple integration that we offer here will allow your customers to pay securely and easily. You can choose PayPal Payments Standard, which we discuss in this topic. Or, you can exploit the advantages of PayPal Payments Pro. PayPal is one of several payment service integrations that we offer in Logiforms; you might also consider Authorize.net and eSelect Payment Gateway. With this profile, Logiforms redirects the user to the PayPal website, where the payment is made either through your PayPal account or their credit card. The user doesn't need to have a PayPal account. Unlike PayPal Payments Pro, there are no monthly fees from PayPal Payments Standard. When you configure this profile, Logiforms will add a number of hidden fields to your form-each having the prefix "Paypal" and contain a value for the PayPal transaction. Several of these field values are available for your use in autoresponders, notifications. Also, after payment is made, you can use an AutoResponder rule to indicate a success or failure message depending on the result from PayPal. See more in the AutoResponders and Notifications section below. We have setup an integration between Logiforms and the PayPal IPN System (Instant Payment Notification) systems. We monitor the payment process and update your submission data with the results of the PayPal transaction. For PayPal Payments Standard, you must have three fields on your form. You will need to select these fields in the Field Mappings step in the wizard: Total Dollar Amount, Quantity, Purchase Description. These fields are mandatory fields for processing PayPal transactions. Total Dollar Amount and Quantity must be numeric values, and Purchase Description should be alpha-numeric. These fields need to be present on your form before you can set up this integration. Otherwise, you'll have to exit the wizard, add the fields, and return to the wizard. You'll need to select these fields in the Field Mapping and Verification Settings panels of the wizard. See the Creating an Authorize.net Profile section below. A user may decide to cancel the transaction after the redirection to the PayPal page. To accommodate this possibility, you'll need to once more redirect the user to a cancellation page if they choose the Cancel button on the PayPal website. You might consider creating a page on your website that perhaps includes a customer service number and provides guidance in completing the transaction. In the Profile Type drop-down list, you'll find several types of 3rd party profile types. Choose PayPal Website Payments Standard, click Next, and click Next once more. In the General & PayPal Settings panel of the wizard, enter a Profile Name and check the box for Default Profile if that is your preference. In the PayPal Account Settings section, first enter the PayPal Identity Token. This required field is the Payment Data Transfer Key for your PayPal Payments Standard account. Also, enter you PayPal Email Address. Set Test Mode to True when you are testing your form. To submit forms in this mode, you must have a PayPal Developer account, and the PayPal Identity Token and PayPay Email Address must correspond to that developer account. When you complete your form, come back to the profile and set this value to False, and also change the PayPal Identity Token and PayPay Email Address to values that correspond to your regular PayPal account. Lastly in this panel, leave the Deferred Email Delivery value as True if you want to defer autoresponder / notification message delivery until after the user return from the PayPal website. It's important to realize that if you leave this value to False, such messages will trigger immediately upon submission of the form, and will trigger again when the user returns from PayPal. This will result in two autoresponders / notifications per user. See more in the AutoResponders and Notifications section below. Click to move on to the PayPal Payment Page Settings panel. In the PayPal Payment Page Settings panel, you may want to set the Open PayPal in New Window value to True if you want to the PayPal webpage to appear in a separate browser window. Leave this value as False if you want to the PayPal webpage to display in the same browser window that contains your form. Consider if you have a Page Style already setup for your PayPal account and enter the name for that style here. Otherwise, leave this value blank. Next, decide if you want to Allow user to change quantity on PayPal page, Prompt User for Shipping Address, or Allow Customer to enter a Note to the Seller. Once you're happy with the settings on this panel, click Next to move to the PayPal Return Settings panel. After your customer completes your form, the submission data goes into your database, the autoresponders & notifications run (unless you set Deferred Email Delivery to True in the Profile Settings panel), and the user is sent to PayPal. You need to decide if you want your user to Return to Logiforms upon completion of the payment at the PayPal website. If you leave the value as Yes, then you'll need to specify a URL to which the user will navigate if the cancel the payment. Enter this value into Cancel URL. In the Field Mappings panel, all of the settings are mandatory. For the first three settings, you must choose the fields on the form that correspond to a Total Dollar Amount, Quantity, and Purchase Description. Remember that each of these is required by PayPal. Also, for Tax and Shipping, decide if you want to use the settings from your PayPal account, or instead use values that you take from the form. When you're happy with the field mappings, click Next to move on to the final step in the wizard, the New PayPal Account Settings panel. This is entirely optional, but you might want to assist users who do not have an existing PayPal account. By mapping the fields on the form with the PayPal destination fields, the data will pre-populate and the ease the task of setting up a PayPal account. This is quite easily done, if you simply provide fields on your form which correspond to the mandatory data elements necessary to establish a PayPal account. Also, see the Preparing the Form section in this topic, above. In the New PayPal Account Settings panel, click the Edit Mapping button. 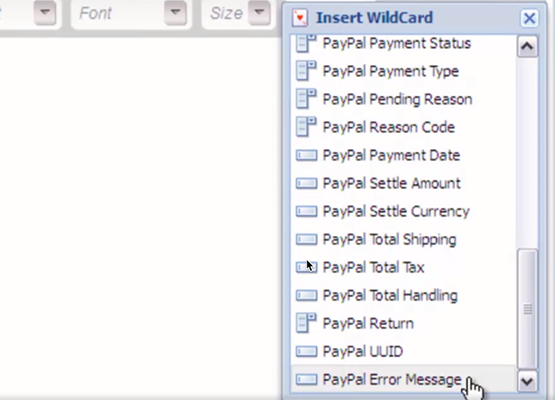 In the window that appears, choose the Source Form Field that will correspond to each of the PayPal Destination fields. Behind the scenes, PayPal connects to Logiforms through IPN (Instant Paymemt Notification) to notify us about changes to order status. We get such notifications at the time the order is first submitted, and again when the order changes from pending to approved. If you want to take some action when the order status changes to approved, you'll need to create an UPDATE mode trigger which performs additional processing when the values of the record change. This field contains the result of the transaction. The initial value of this field will be Unprocessed, and is set immediately at the time of submission but also prior to PayPal's receipt of the transaction. When the user successfully completes the transaction at PayPal, the value is set to Completed. Depending on the result of user action or processing events, the value may be set to Failed or Pending. This field indicates if the user has completed the payment at the PayPal website, after which it will contain the value postPayment. Using these two fields together, you can build autoresponder or notification profiles to meet your specific needs. A good practice is to delay sending such messages until after the user returns from PayPal. 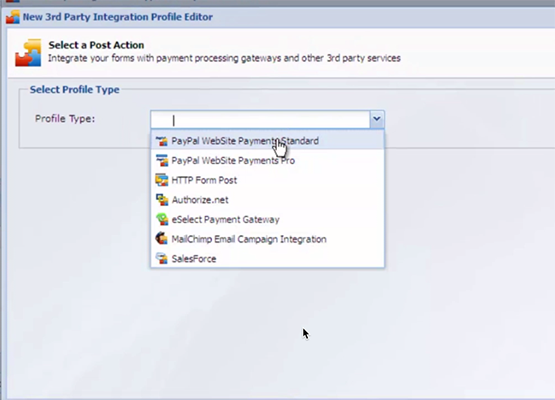 As we explain above in the section Creating a PayPal Payments Standard Profile, you can avoid sending autoresponder / notification messages immediately after the form submission by setting Deferred Email Delivery value to True. The other rule could take this form: IF PayPal Return = postPayment AND paypal_payment_status DOES NOT EQUAL 'Completed' THEN Send the "Failure" AutoResponder. I have just opened our Logiforms account, and I am attempting to design my first form for our website (SturbridgePress.com), now under construction and nearing completion. The instructions on this page seem fairly clear, and I am confident that I will be able to successfully follow the instructions in creating a prototype (by that, I mean "re-useable") product-display-purchase form that I can then drop into our website at various places as needed. However, this page of instructions needs careful proofreading and copyediting in order to clean up spelling, punctuation, and syntax, etc. Since I myself am an experienced proofreader and copyeditor, would Logiforms be interested in my helping you—with proofreading and copyediting services—in return for your crediting my Logiforms account for future costs incurred by SturbridgePress? This could be a very beneficial arrangements for both of us. I will await your reply as I continue becoming familiar with design Logiforms instructions. Thank for your courtesy. I have just opened our Logiforms account, and I am attempting to design my first form for our website (SturbridgePress.com) now under construction and nearing completion. The instructions on this page seem fairly clear, and I am confident that I will be able to successfully follow the instructions in creating a prototype (by that, I mean "re-useable") product-display-purchase form that I can then drop into our website at various places as needed. However, this page of instructions needs careful proofreading and copyediting in order to clean up spelling, punctuation, and syntax, etc. Since I myself am an experienced proofreader and copyeditor, would Logiforms be interested in my helping you—with proofreading and copyediting services—in return for your crediting my Logiforms account for future costs incurred by SturbridgePress? This could be a very beneficial arrangements for both of us. I will await your reply as I continue becoming familiar with design Logiforms instructions. Thank for your courtesy. I have just opened our Logiforms account, and I am attempting to design my first form for our website (www.SturbridgePress.com) now under construction and nearing completion. The instructions on this page seem fairly clear, and I am confident that I will be able to successfully follow the instructions in creating a prototype (by that, I mean "re-useable") product-display-purchase form that I can then drop into our website at various places as needed. However, this page of instructions needs careful proofreading and copyediting in order to clean up spelling, punctuation, and syntax, etc. Since I myself am an experienced proofreader and copyeditor, would Logiforms be interested in my helping you—with proofreading and copyediting services—in return for your crediting my Logiforms account for future costs incurred by SturbridgePress? This could be a very beneficial arrangements for both of us. I will await your reply as I continue becoming familiar with design Logiforms instructions. Thank for your courtesy. I have just opened our Logiforms account, and I am attempting to design my first form for our website (www.SturbridgePress.com) now under construction and nearing completion. The instructions on this page seem fairly clear, and I am confident that I will be able to successfully follow the instructions in creating a prototype (by that, I mean "re-useable") product-display-purchase form that we can then drop into our website at various places as needed. However, this page of instructions needs careful proofreading and copyediting in order to clean up spelling, punctuation, and syntax, etc. Since I myself am an experienced proofreader and copyeditor, would Logiforms be interested in my helping you—with proofreading and copyediting services—in return for your crediting my Logiforms account for future costs incurred by SturbridgePress? This could be a very beneficial arrangements for both of us. I will await your reply as I continue becoming familiar with design Logiforms instructions. Thank for your courtesy. I have just opened our Logiforms account, and I am attempting to design my first form for our website (www.SturbridgePress.com) now under construction and nearing completion. The instructions on this page seem fairly clear, and I am confident that I will be able to successfully follow the instructions in creating a prototype (by that, I mean "re-useable") product-display-purchase form that we can then drop into our website at various places as needed. However, this page of instructions needs careful proofreading and copy editing in order to clean up spelling, punctuation, and syntax, etc. Since I myself am an experienced proofreader and copy editor, would Logiforms be interested in my helping you—with proofreading and copyediting services—in return for your crediting my Logiforms account for future costs incurred by SturbridgePress? This could be a very beneficial arrangements for both of us. I will await your reply as I continue becoming familiar with design Logiforms instructions. Thank for your courtesy. I have just opened our Logiforms account, and I am attempting to design my first form for our website (www.SturbridgePress.com) now under construction and nearing completion. The instructions on this page seem fairly clear, and I am confident that I will be able to successfully follow the instructions in creating a prototype (by that, I mean "re-useable") product-display-purchase form that we can then drop into our website at various places as needed. However, this page of instructions needs careful proofreading and copy editing in order to clean up spelling, punctuation, and syntax, etc. Since I myself am an experienced proofreader and copy editor, would Logiforms be interested in my helping you—with proofreading and copy editing services—in return for your crediting my Logiforms account for future costs incurred by SturbridgePress? This could be a very beneficial arrangements for both of us. I will await your reply as I continue becoming familiar with design Logiforms instructions. Thank for your courtesy. I have just opened our Logiforms account, and I am attempting to design my first form for our website (www.SturbridgePress.com) now under construction and nearing completion. The instructions on this page seem fairly clear, and I am confident that I will be able to successfully follow the instructions in creating a prototype (by that, I mean "re-useable") product-display-purchase form that we can then drop into our website at various places as needed. However, this page of instructions needs careful proofreading and copy editing in order to clean up spelling, punctuation, and syntax, etc. Since I myself am an experienced proofreader and copy editor, would Logiforms be interested in my helping you—with proofreading and copy editing services—in return for your crediting my account for future Logiforms costs incurred by SturbridgePress? This could be a very beneficial arrangements for both of us. I will await your reply as I continue becoming familiar with design Logiforms instructions. Thank for your courtesy. I have just opened our Logiforms account, and I am attempting to design my first form for our website (www.SturbridgePress.com) now under construction and nearing completion. The instructions on this page seem fairly clear, and I am confident that I will be able to successfully follow the instructions in creating a prototype (by that, I mean "re-useable") product-display-purchase form that we can then drop into our website at various places as needed. However, this page of instructions needs careful proofreading and copy editing in order to clean up spelling, punctuation, and syntax, etc. Since I myself am an experienced proofreader and copy editor, would Logiforms be interested in my helping you—with proofreading and copy editing services—in return for your crediting my account for future Logiforms costs incurred by SturbridgePress? This could be a very beneficial arrangements for both of us. I will await your reply as I continue becoming familiar with Logiforms design instructions. Thank for your courtesy.